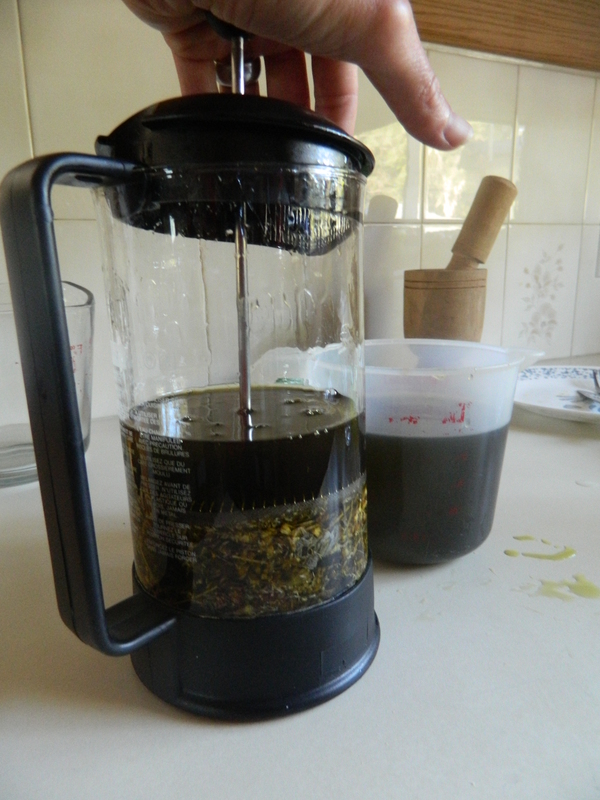 In the following pictures you will see that I infused my oil with medicinal herbs. This step in not necessary, but it results in a multi-functional product. 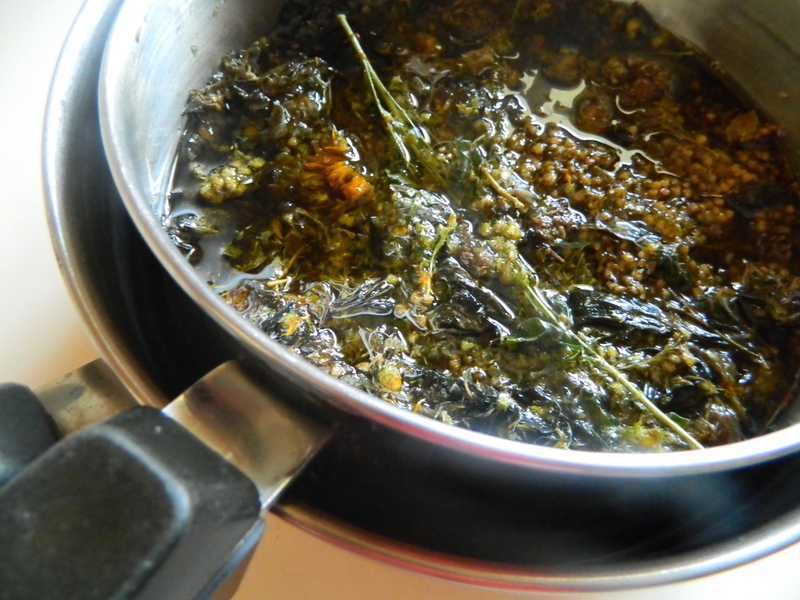 Step One – Infuse oil with herbs. (There are many different kinds of oil to choose from. 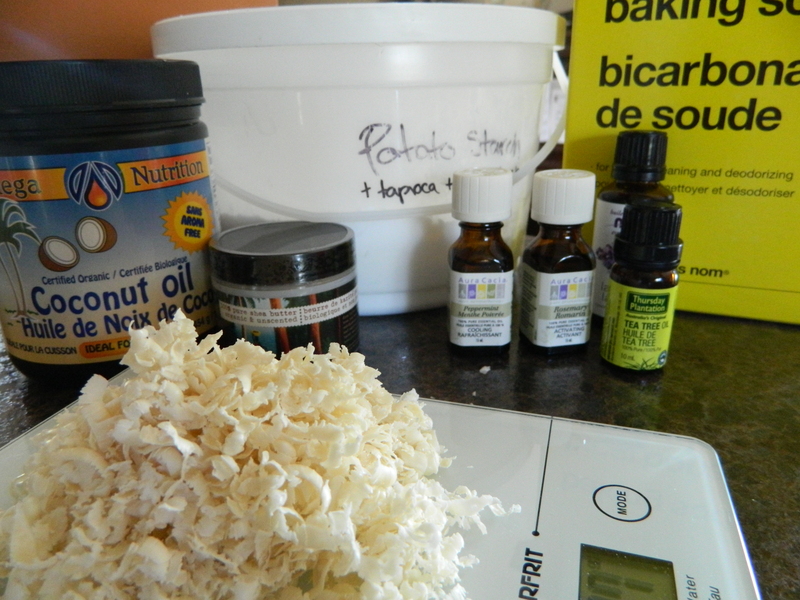 I often use a mix of grapeseed, olive and canola oil). In this batch I combined some oil I had infused at room temp. 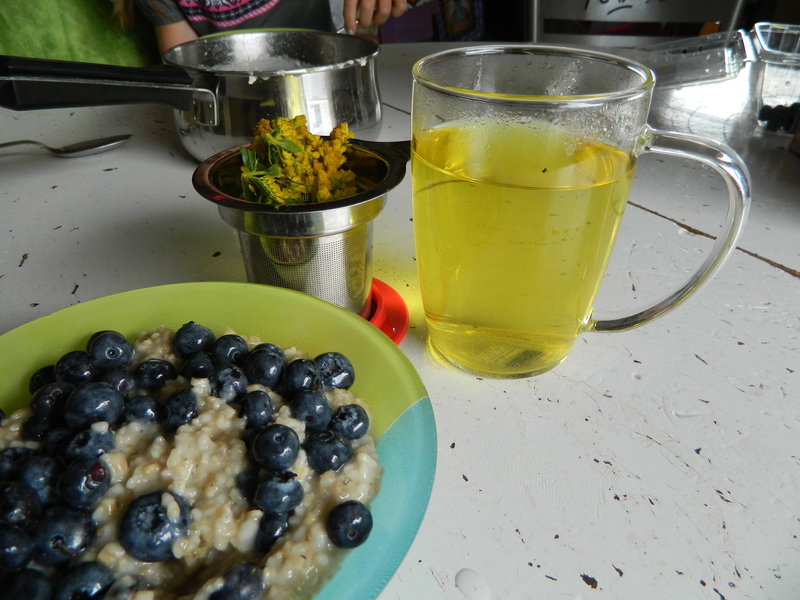 for several weeks, with oil infused in a double-boiler. I used the following garden/wild botanicals: calendula, spruce tips, dandelion blossoms, plantain, red clover, golden rod, and chamomile. I buy my beeswax in big bricks from a local honey farmer. Step Four: Once the beeswax has melted, add the oils and stir until everything is combined. Take the mix off the heat, add the essential oils, and stir. 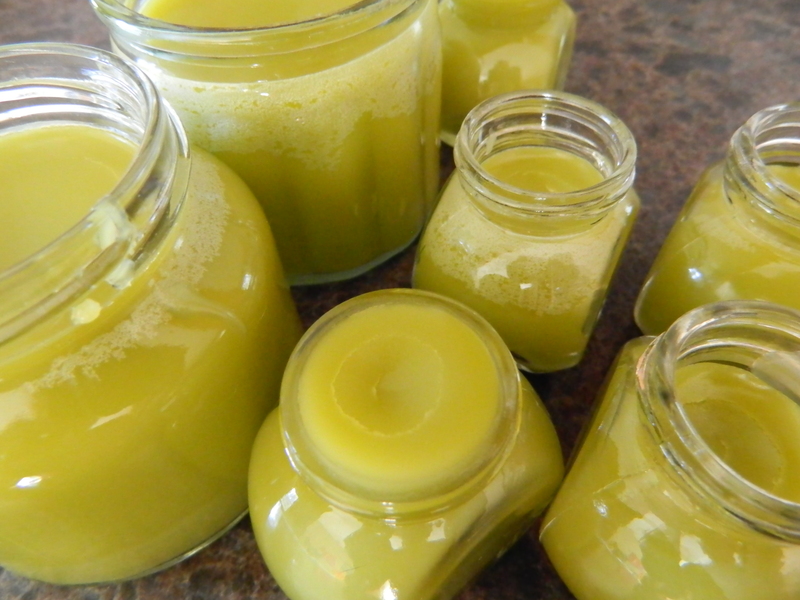 Pour into clean sterilized jars and store at room temp. This lasts a long time. I’ve never had it go bad yet. Reason #2 for posting—-Upcoming mini-conference for mothers in Manitoba! If you are interested in attending, leave a comment and I will send you more details. 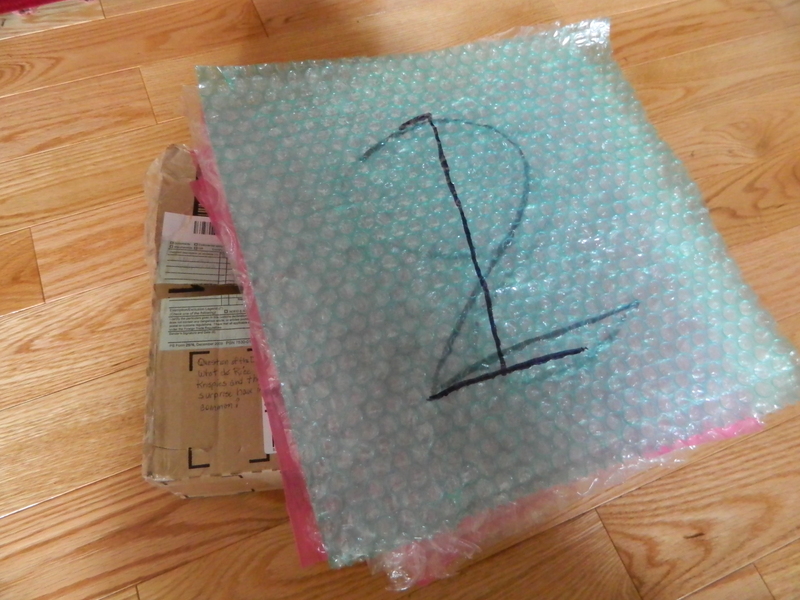 This week the girls opened up the front door and found a package on the porch they had anticipating for days. My daughters belong to a very elite club- “The Surprise of the Month Club”, and their grandma is the ringleader. Written on the front of the package. Can you guess? 1. 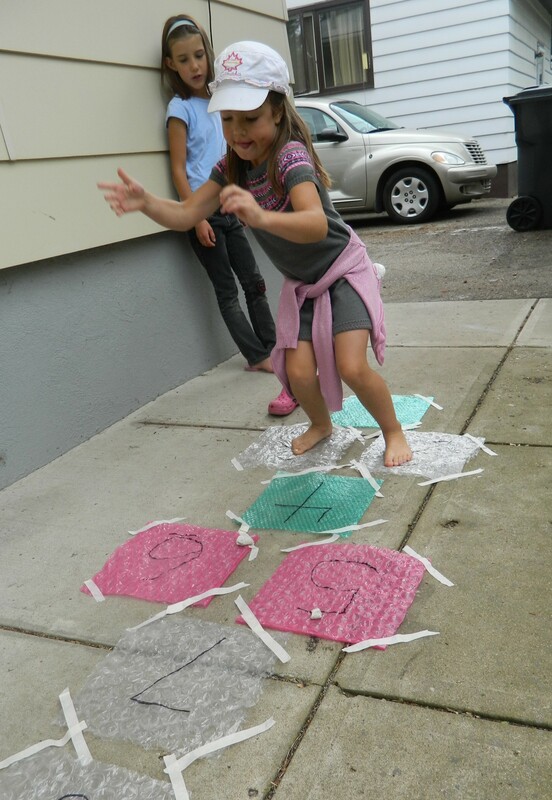 Cut out 10 squares of bubble wrap (the ones with the quarter-sized bubbles work the best) and write a number on each one with permanent marker. 2. Set up the squares any way you want for a rip-roaring game. 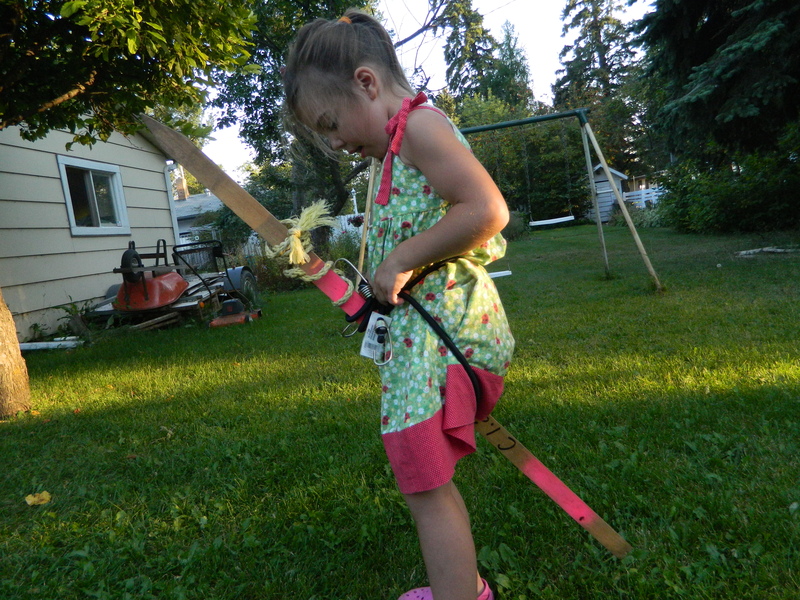 We had to tape them down because it was a little breezy. They worked great inside. 3. Enjoy the sound effects! Here is the woman herself, with her son. 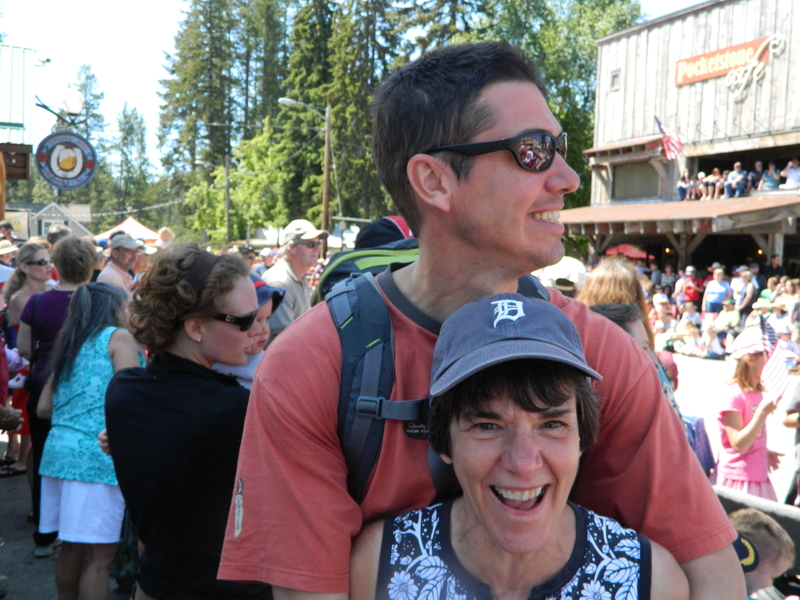 Stan and his mom at a fourth of July parade this summer. New neighbours moved in, two doors down, this weekend. I saw the guy for the first time this Saturday when I was biking home with this bouquet. I pulled my bike into the driveway to welcome them into the neighbourhood. He was wearing an AC/DC teeshirt, unloading his weights, and weight bench, into the house. I’m sure we’ll get along wonderfully. I’m looking forward to using this herb topically. (Read: I tried drinking the tea and almost gagged. I have NO idea why anyone would consider this a “pleasant” tea, as I’ve read many times.) I plan on infusing oil with it to make a salve, because of it’s anti-inflammatory, anti-septic, anti-spasmodic, and immune boosting qualities. During the crusades people also called this plant “woundwort” for its usefulness in treating cuts and stopping blood flow. The University of Maryland has more information on the medicinal qualities of Goldenrod. 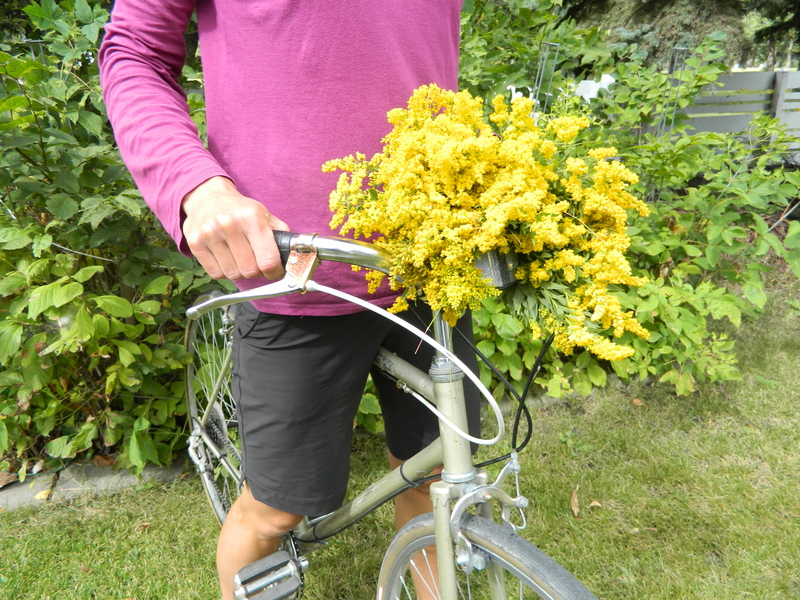 For pictures to help with identification, check this site: Canada Goldenrod Solidago canadensis – Ontario Wildflowers. Here’s the tea, all set up for a wonderful blog shot (ok, not really). This is after I made myself take 4 or 5 sips, each time reacting with a throaty growl and a shake of the head. I took this photo with the hopes that someone might explain how people get this stuff down, and enjoy it. Their survey sticks satiated their horse longings, at least for tonight. 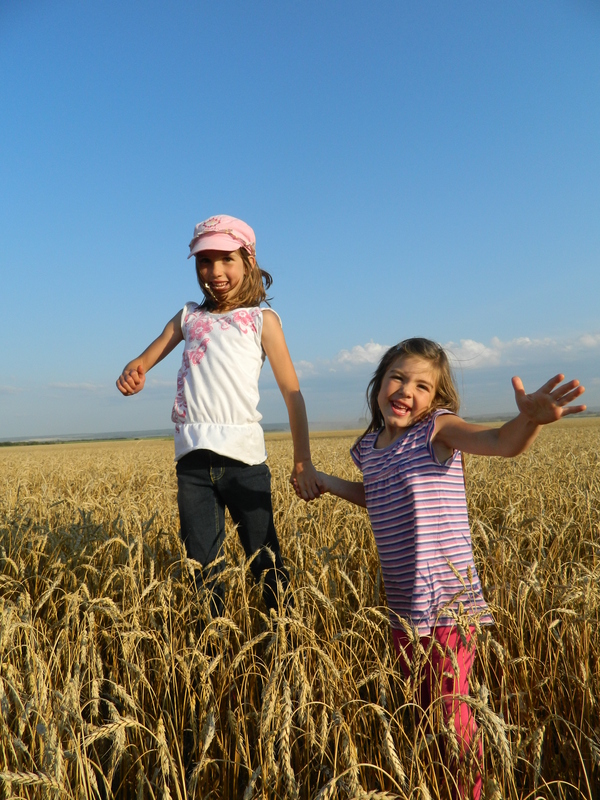 Wheat harvest: My dad and 2 brothers farm together. It happens every time my daughters go visit their cousins. The whole car ride home is one long sigh and explanation of why we don’t live in the country. The 6 man crew stops for a hot supper. 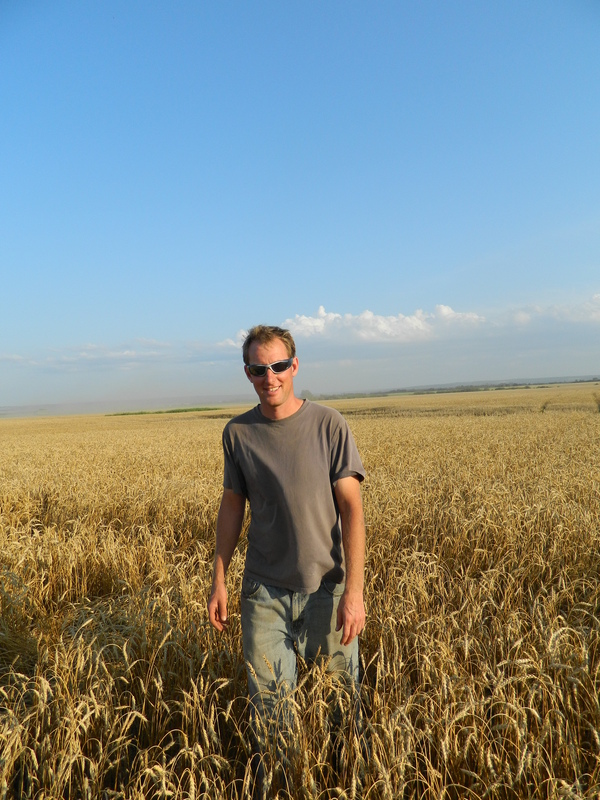 My older brother (the snow shoveler) in his wheat field. But the reality is we live in a 60’x100′ lot, four blocks away from a McDonald’s. Sometimes life doesn’t work out the way we imagined it would. At some point during these lament-why-we-don’t-live-in-the-country car rides I usually like to ask my girls, and myself, “What is it that you like about where we live right now?” Living biking distance from the library and friends’ houses are always at the top of our list. I also think there is value in trying to live sustainably in an urban setting, since most people in the world will never be able to own huge swaths of land. This is not to say we don’t brainstorm about ideas on how might get our own piece of rural property and join our generation of back-to-the-landers. 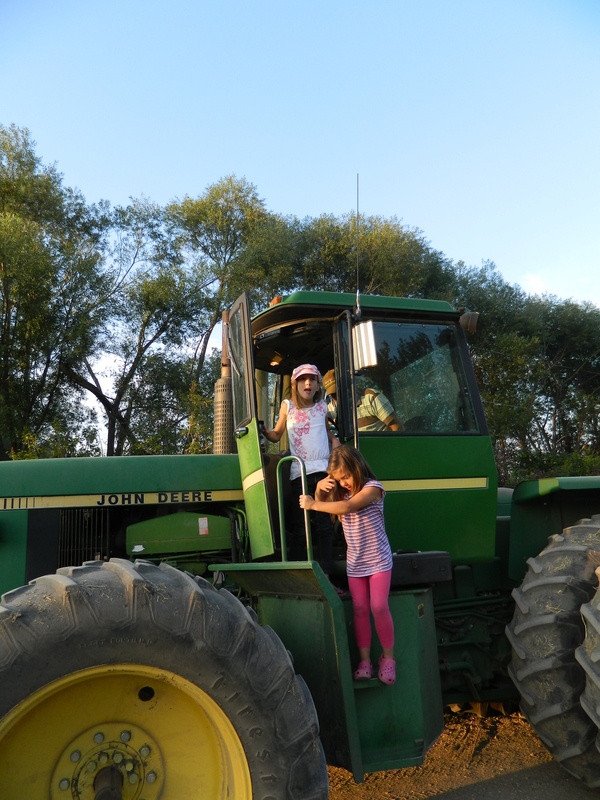 But to be honest, those conversations always end up with me questioning how we are going to shod our children’s feet, envisioning buck-skin wardrobes and a lot of stress in general. This week was a double whammy. 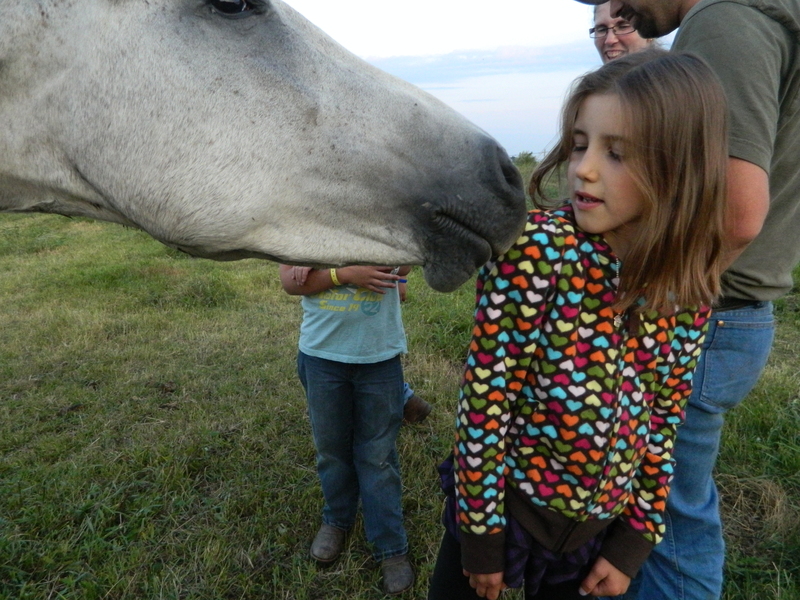 A friend of Stan’s invited us to his acreage to ride horses. If you have a girl you can imagine the consequences! 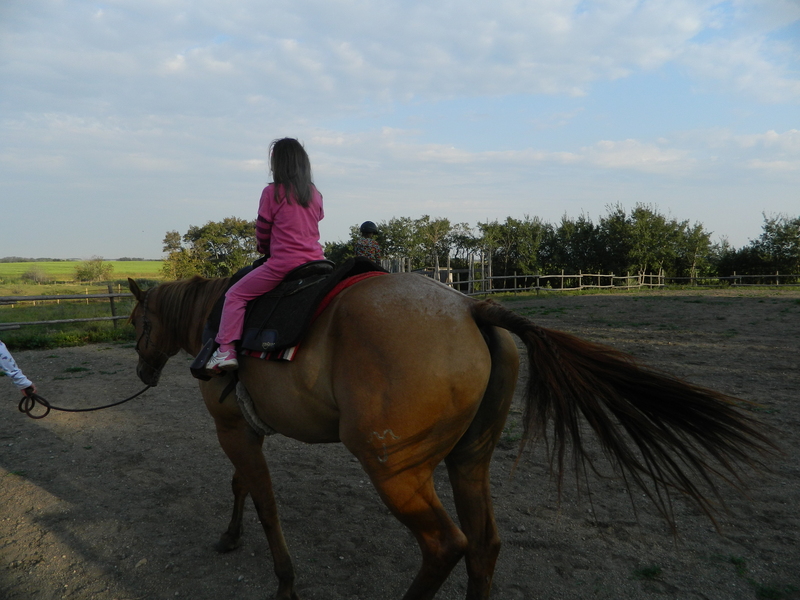 Belén started cantering with her horse (unintentionally) and she now considers herself a “real cowgirl”. So here we are, with a street address and neighbours we can wave to while sitting at our dining room table. Perhaps we will fulfill Belén’s wishes and be somewhere else by this time next year. I’m kind of doubtful though. In the mean time I hope to keep adding to our list of what we like about here; the place we’re at right now. PS: How many of you will be two stepping in your kitchen after you read this post, humming the song in the title? PPS: Did you know that Latin name for Goldenrod is Solidago and it means “to make whole”. More on that later.